NOTE : FULL VERSION 0.6J IS NOW AVAILABLE! It contains a good performance increase which is helpful at the new Westhill track. Also there are more fixes and improvements including support for the Oculus Rift 0.6 runtime. Entering Rift mode is now very simple : Options... View... 3D button at the top of the screen. Do not force vertical sync in Rift mode as it would limit frame rate to monitor refresh rate. SLI in Rift mode will probably cause a stuttering image - please disable SLI. Please keep a backup of your LFS.exe from 0.6H so you can easily go back if there are any problems. Last edited by Scawen, Sat, 15 Aug 2015 14:25 .
only noticed with external camera. Last edited by Flotch, Sat, 20 Jun 2015 08:27 . Last edited by nacim, Sat, 20 Jun 2015 13:41 . Lol, nice ones ! I really like the line who just says "F*ck physics, and your car !" EDIT : Bug report, with VSync enabled, LFS minimised seems to run with 0ms sleep ,causing my screen head phones to coil whine. Last edited by nacim, Sat, 20 Jun 2015 19:01 . A small suggestion as you are working on it. Can you add a new button for layout makers to dublicate the object into the same position? Like "o" but into the same x/y/z. Maybe "n" (new) ? Also what about the new .dll? Do we need both of them? EDIT: Oh and while you right click at the "x/y/z" in multiple objects, it would be nice to be able to set them at that value, cause now it only works in a single object. It's helpful to align them into the same coordinate. Last edited by DarkKostas, Sun, 21 Jun 2015 00:10 . When the framerate isn't limited indeed. And wow.. System memory usage dropped from 900 Mb -> 550 Mb @DX9Ex (when being online with Westhill) ... Nice! Last edited by cargame.nl, Sun, 21 Jun 2015 05:18 . Quote from borja_s13 : The toilet is black? EDIT: Im wrong, check my next post. Last edited by MandulAA, Sun, 21 Jun 2015 14:33 . It isn't black for me too. borja_s13, check your textures mods. No , for some other users its too. 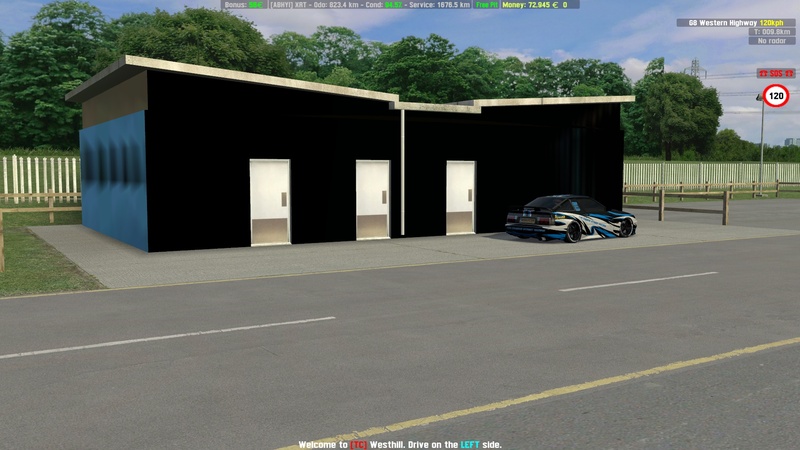 Enter in shift u mode , its sometimes , not always..
You are right, the toilets have some weird textures only if using Shift+U mode and the car is close to them. Check pictures. For the record, Im always using a pure and clean install of LFS to test these patches, without any mods. Last edited by MandulAA, Sun, 21 Jun 2015 14:40 . Yes , when u are near , in diferent cams ... sometimes it fails.. Thank you for the bug reports and suggestions (e.g. Sleep needed at some times). I confirm I can reproduce the shiny buildings bug, when a car shadow is near some of the buildings or other objects with sky reflections. When you are in a place where a lot of objects may be visible from that location but you are looking in a direction where not so many of them are visible. You can test this effect by holding down CTRL at any time. You should then see a frame rate drop as it uses the old style draw. The optimisation (i.e. when you do not hold CTRL) is most useful in SHIFT+U mode, because there are no draw lists to hide most of the objects (that already avoided the radius check on most objects). Last edited by Scawen, Sun, 21 Jun 2015 16:16 . Quote from DarkKostas : A small suggestion as you are working on it. Can you add a new button for layout makers to dublicate the object into the same position? Like "o" but into the same x/y/z. Maybe "n" (new) ? I think I know what you mean but it is not allowed to have the same objects in the same position. I suppose you mean for concrete objects, you want to create them in that position then move them to a different position? But the way the system works, you can't have the same objects in the same position at any time. So I'm not sure how to help. Can you describe an example of the situation where it might help? Do you know the SHIFT+O / SHIFT+M keys to position objects to the nearest metre? I know it's not really what you are talking about, but it helps when objecs are aligned on the metre grid, then you can easily align other objects to the metre grid as well. Quote from DarkKostas : Also what about the new .dll? Do we need both of them? LFSORDLL.dll is the Rift DLL for the older Oculus runtime. The old LFS.exe uses that one. The new LFS.exe uses the ORDIRECT.dll to use the Oculus 0.6.0.0 runtime. Works perfectly fine here. Good news is that introduction of D3D9Ex doesn't seem to cause any trouble with WINE. If you want to get even more juice, you can check bounding boxes or sphere depending on the object to be even more accurate in which object to draw. Last edited by nacim, Sun, 21 Jun 2015 20:04 . Quote from Scawen : I suppose you mean for concrete objects, you want to create them in that position then move them to a different position? But the way the system works, you can't have the same objects in the same position at any time. instead of having to place the new one and then move it manually into the new position. I didn't know about SHIFT+O/M, i'll give it a try later. Quote from Scawen : LFSORDLL.dll is the Rift DLL for the older Oculus runtime. The old LFS.exe uses that one. The new LFS.exe uses the ORDIRECT.dll to use the Oculus 0.6.0.0 runtime. Thanks for your answers. So i guess people using the new version can just remove the LFSORDLL.dll and keep just the other one Cheers. both code paths (with Ctrl and without) do the same frustum culling with same values and same objects, the difference is only in memory layout. The new optimized code does have pos+radius data for culling outside of object in continuous memory block, so the culling has better cache-hit ratio, than checking the data all over the place scattered inside each object's instance memory. Hmmm.. Scawen used wording "in another list", but I think he meant C++ vector, so the data really are next to each other in memory without the need to do some dereferencing of pointers just to reject object as not visible. If in the future the amount of objects on map will keep rising, he may very likely gain further performance by using some meta rejections of whole groups, like having some spatial tree (maybe even some dynamic along grid lines, or BSP ones for static objects), or just meta boundary balls containing many smaller objects. Then again, the last time I did work with 3D programming, having some thousands of tris in the GPU and drawing them in single batch with single material was often as fast as culling them on the CPU... And that was like 10y back. Meanwhile the whole world of 3D engines did change dramatically, with the deferred rendering being now preferred way (didn't even exist back when I was insider), so I may be heavily misguided by my old knowledge. Although at the base you have some thousands of floats to process, either on CPU or GPU, and some old truths like avoiding cache-misses still apply, as Scawen demonstrated just now. You are right, that's a way more subtile change than thought. Thanks for clarification, and you just learn me something (which is totally normal, I'm a newbie in 3D engine developpement). EDIT : After some thoughts, there is something I want to know : This technique works only for static objects right ? Because dynamics ones need to update their position in the vector and so there is even performance loss or them, right ? Last edited by nacim, Mon, 22 Jun 2015 10:16 . On the side note, I'd like to be able to select multiple objects more easily. For example you make a rectangle using mouse and all objects that are inside of this rectangle are selected. This "adds" the current selection into the new position. Your video is a good example though of why i'd like to have something like that. Check your cones? The ain't aligned perfectly. 5. Go back at 2. That way you can have perfectly aligned cones with same spacing. Once you're done, you can do as you've done to the video and copy them to another place. Then as Scawen said, try SHIFT+O to place objects to the nearest metre, that should help a bit.